Hazardous waste is a special class of solid waste that must be managed properly to protect human health and the environment. Federal and state laws regulate how businesses, institutions, governments and other non-households must manage this waste. These regulations do not cover most hazardous waste generated by households, but household hazardous waste should be managed carefully as well. In Wisconsin, there are currently about 11, 000 businesses, schools and government institutions that generate varying quantities and types of hazardous waste. The number of hazardous waste generators and the quantity of hazardous waste generated has declined in recent years, mostly due to successful waste minimization efforts, the economy and the cost of disposal. State and federal law require businesses and institutions to determine if their waste is hazardous. A business can determine if it generates hazardous waste by carefully reviewing ch. NR 661, Wis. Adm. Code, and by answering the following questions. Is the material solid waste? 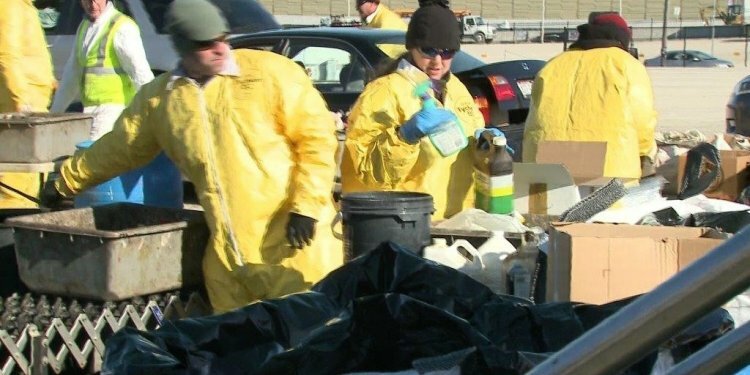 Is it excluded from the hazardous waste rules? Is it a listed or characteristic hazardous waste? Is it a mixture containing hazardous waste, or is it derived from hazardous waste? Waste Determinations and Recordkeeping (WA-1152) [PDF] can help you with the hazardous waste identification process. If your business generates hazardous waste you must determine the quantity you generate in any given month and establish your generator status. If your business or institution generates hazardous waste, you must comply with certain requirements, depending on the quantity of hazardous waste you generate during any given month. All hazardous waste generators must make a waste determination and properly dispose of their hazardous waste. Additional requirements apply based on the generator classification. The table below lists generation and storage limits for each generator classification. As a reference, 220 pounds equals approximately half of a 55-gallon drum.